Coloring speaks to my heart in many ways. First, as a child I was never able to make my arts and crafts look like the other kids. By the time I hit the 5th grade I knew I was never going to be an artist. I hated seeing my art displayed next to the other kids. I began using the common “I can’t even draw a straight line,” something I hear other adults say all the time. Coloring changed that for me. I don’t have to draw and my coloring doesn’t have to be the same as everyone else’s. I can choose the designs I want to color, and choose the colors and effects I want. I only have to please myself, although I appreciate that I get lot of pats on the back from friends, family and my fellow colorists. I even have some of my colorings displayed in frames in my home. Second, and just as important, coloring helps me with me. As someone who has an anxiety disorder, coloring has become a way to calm myself. I am happy, calm and focused while I color. As I begin to create something I am pleased with, it makes me feel satisfied and creative. Coloring has given me a large supportive community. My anxiety makes it hard for me to go out and deal with social situations. By joining an online colorist community, I am able to share my work and get support while also supporting others in their efforts. Coloring has colored my world. 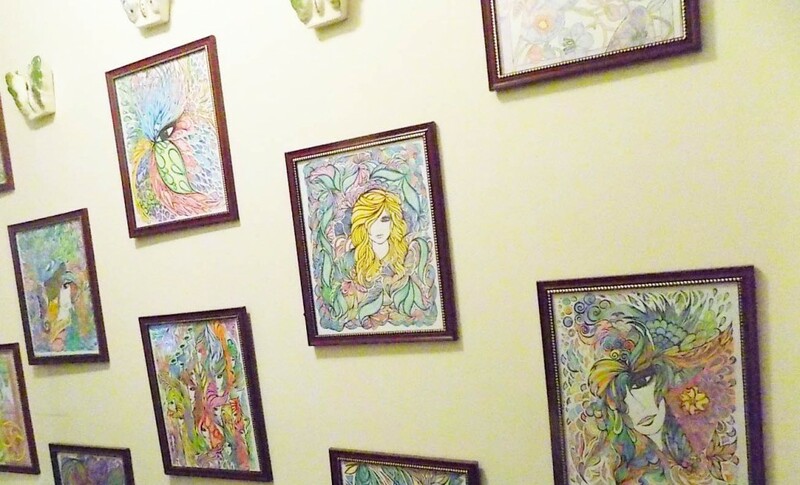 Hallway in Dannie’s house showing some of her colorings. Since I started coloring, I am now willing to try new artistic things. I recently baked for the first time in years, as coloring has given me more confidence in my ability to create. I no longer put my creative side down, and I’m even planning to take some craft classes and learn to draw this year. I have also discovered that I can change my photos (one of my few creative outlets before coloring) into black and white line art to color. Coloring has helped heal me, calm me, allowed me to embrace my creativity, and enabled meeting like-minded people. It has also helped me recover some of my courage. Since I started coloring, I am once again writing poetry. but have never been put in books. and not part of the collection.